Virgin Islands residents have reported being hassled by Homeland Security agents when they use their V.I. licenses as identification while traveling between the territory and the States, but that will soon change according to Bureau of Motor Vehicles Director Lawrence Olive. Since 2017, V.I. licenses have had the words “Not For Federal Use” printed on them. The fifty states and other territories have converted to Real IDs after federal legislation mandated their use in 2005. The V.I. Bureau of Motor Vehicles has had setbacks in its conversion to Real IDs, the most recent being the hurricanes of 2017. 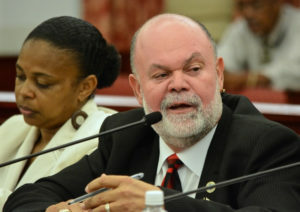 Olive testified before the Senate Committee on Finance during a budget hearing Thursday and said Homeland Security has granted an extension for use of the old drivers’ licenses for travel identification. Word just has not gotten to all the offices of the Transportation Security Agency, he said. The problem should be resolved beginning on Oct. 10 when the BMV plans to start issuing Real IDs that comply with federal requirements. However, residents with the old licenses that are unexpired might still run into the travel problem unless they pay for a new license. Sen. Nereida Rivera-O’Reilly said she wanted to be assured that residents would not be paying full-price for basically exchanging an unexpired license for the new Real IDs. She said it was no fault of theirs that they were not issued the Real IDs to begin with. After questioning from Sen. Kurt Vialet, chairman of the committee, Olive said residents would only have to pay the difference in cost between the old licenses and the new Real IDs. Olive said the current licenses cost $47 and the new ones will cost between $60 and $70. Residents will not be forced to get replacement licenses. The old licenses will serve in most cases until they expire. They just will not be valid for airline travel. The Virgin Islands’ journey towards getting residents Real IDs has been a long road. In April 2016, Olive told the Senate Committee on Government Services, Consumers and Veteran’s Affairs the more secure licenses and identification cards mandated by the federal Real ID Act would be available before the end of the year. Instead, in June of 2017, Atty. Gen. Claude Walker announced the arrests of Syed Gilani, owner of BIZVI; Jerris Brown, the former director of the BMV; and Gregory Christian, former project manager at the BMV, on multiple charges including misuse of federal funds. All three men were involved in installing equipment at the BMV that would allow the Virgin Islands to implement Real ID. Although much of the discussion Thursday centered on the Real IDs, Olive was appearing before the Senate to justify his $1.8 million budget request from the General Fund for fiscal year 2019. The request is a decrease of $252,149 from last year. Senators were told the decrease can be made up from the Personalized License Plate Fund. Olive predicted the bureau will be receiving $1.3 million in personalized license plate fees, and total appropriated and non-appropriated funds for next year will be more than $4 million. O’Reilly also questioned Olive about a notice saying anyone registering a car in the Virgin Islands must have a valid V.I. license. She asked how this will affect residents who have only lived a few months in the territory and workers who come for just a few months and do not want to surrender their stateside licenses. Olive said V.I. law states if a person is in the territory for more than 90 days and wants to drive they must get a V.I. license. He added the only way that can be changed is if the senate changes it. I’m a little confused about the mandate that anyone registering a motor vehicle has to present a valid VI driver’s license as in the past any valid government-issued photographic ID or copy of an out-of-state license has been accepted. Many people who live here part-time maintain primary residences elsewhere. They keep a vehicle or vehicles here for convenience. They are not VI residents and are not required to have a VI driver’s license. They register their cars annually using a third party to complete the renewal. There are also bona fide non-driving residents who purchase, insure and register a vehicle for use by someone who drives them. If this is indeed, as Mr Olive points out, already a mandate in VI law then it hasn’t been followed in the past and if the Senate has to amend the law accordingly then they should do it. Can someone please comment and provide clarity on Anna’s message above? Thanks in advance.